What's All The Hype About Homesick Candles? There has been so much excitement about Homesick Candles! Love the idea, so great for kids away at college or someone who is living away from their home state. We took a look around the web to figure out which companies did it best! First of all we have to applaud Homesick Candles. They really hit the mark! They have received a lot of great press and outstanding reviews for their scents that are truly on point. They even have a running $5 off campaign that has been in place for a bit to take the sting out of this slightly pricey candle. Pottery Barn launched their line of city and state scented candles along with a line of pillows, tote bags, journals and calendars all sticking to the theme of I love my home. Lovely candles, but with a more feminine feel I don't think they have the mass appeal as some of the other candles we found. Want to get personal? Hello You Candles launched their line of state scented candles late last year and they have been steadily growing in popularity. Hello You Candles allows you to include a personal message on the back of all of their candles and when you you combine a scent and a personal message you really get an emotional reaction from the recipient. 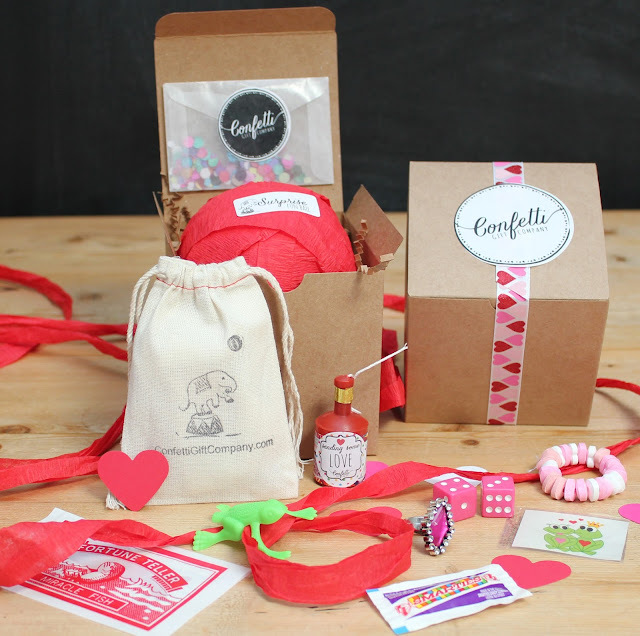 Confetti Gift Company went the extra mile with their Homesick Gift Box. They include a mini state scented candle, matches, a homesick mug and chocolate chip cookies (comfort food) for a very memorable home state gift. We turned to Etys, the handmade marketplace to see what our artisans had to offer. 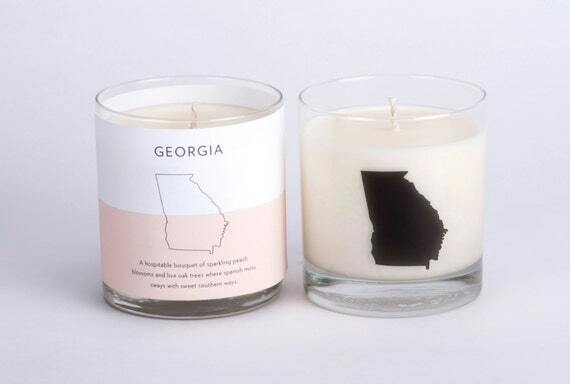 We found a company called Scripted Fragrance that has a limited line of state scented candles. 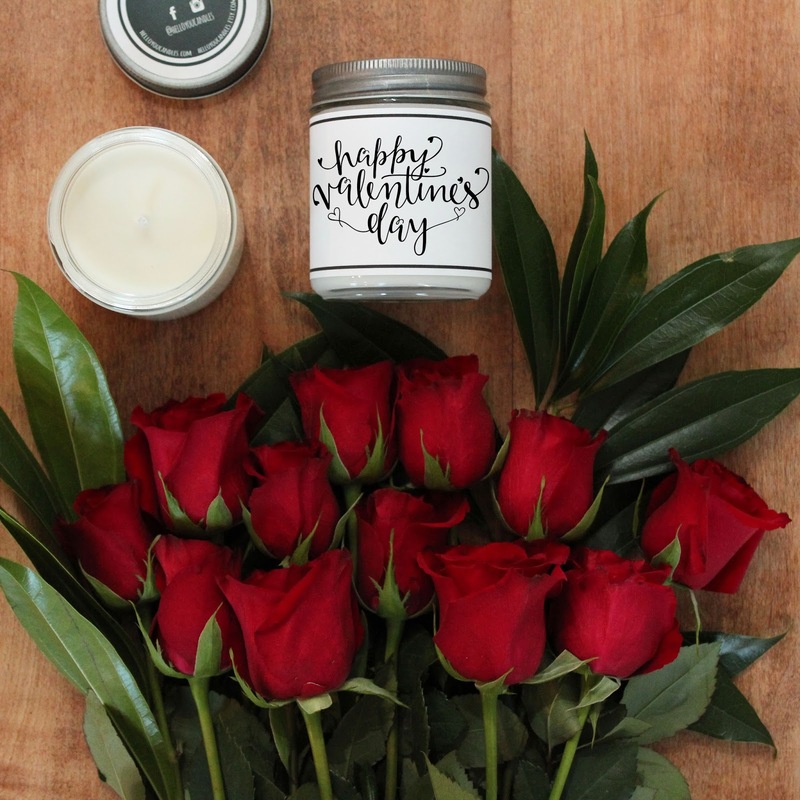 The candles are very pretty and I love that the class jar they come in is printed with the state silhouette that you can keep long after the candle has been burned. 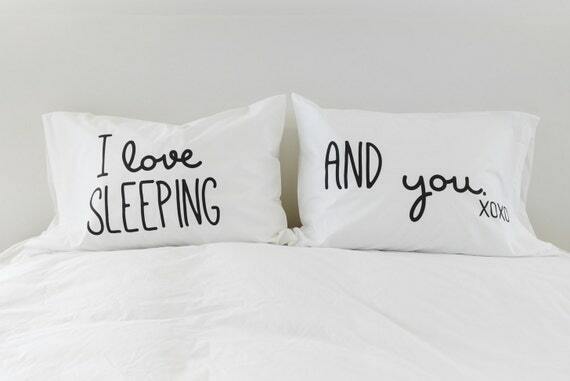 10 Valentine's Day Gifts We Love! When we think Valentine's Day we always gravitate to the usual suspects, candy and flowers. This year it's time to get creative and think outside the heart shaped box! Whether you have been married for 20 years, have only been dating a few months or just need a sweet gift for a child or family member, I thing we found something for everyone on your list. I am in LOVE with this French Love Poems that we found at Anthropologie. This lovely pocket-sized anthology is the perfect present for the one who sets your heart aflutter. Page through poems by the endlessly romantic Guillaume Apollinaire, Stephane Mallarme, Paul Verlaine and many others, translated by English language luminaries including Robert Duncan, William Carlos Williams and Denise Levertov. Perfect for the hopeless romantic. Sparks are sure to fly with these LOVE sparklers, they would brighten up any dessert, or I think I would just add a little message to the bottom of the card they come on and skip the overpriced drug store card all together. Everyone love's candles! At Hello You Candles you can add your own personal message to the back of the candle and they offer a variety of Valentine's Day designs to choose from. They have some great Valentine's Day scents too, dozen roses and box of truffles! They ship within a day or two, so they are a great option for the last minute shopper. For the Kiddo's on your list, or someone who used to be a kid ;) a Valentine's Day Surprise Ball is the perfect gift! They are filled with Valentine's Day toys and trinkets and will prove to be the most fun Valentine's Day gift ever. If you are in need of a class Valentine, Confetti has mini surprise ball favors that are perfect for the occasion! How about a gift that says it all! This Valentine's Day gift box has a little bit of everything which makes it perfect for anyone on your list. Confetti Gift Company will enclose a personal note from you and deliver right to the doorstep of your recipient. And by the way, the chocolate chip cookies are AMAZING! Anything from Lush is a favorite at my house! You can order one of their pre-made boxes or put together your own. Can't go wrong with this handmade, environmentally friendly product line. And last, but definitely not least WINE! Anything from Justin Winery in Paso Robles, CA is our favorite. We were lucky enough to visit the winery and fell in love with everything about it. I found it today on Wine.com but it can be purchased at many online retailers and in stores. I would love to hear your feedback about any of the products we mentioned :) Now get shopping, Valentine's day is only 20 days away! Brighten someone's day with a Box of Sunshine! Rain, rain, go away, come again another day! Yes, we need the rain but enough is enough, time for a little sunshine. 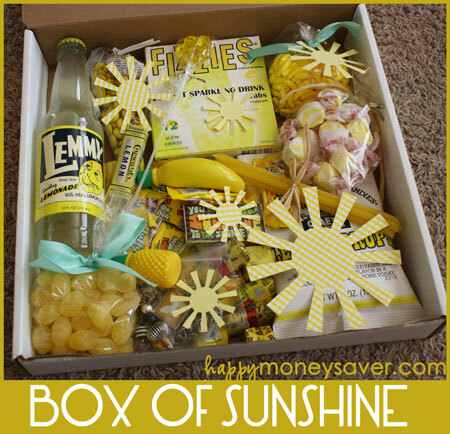 A hot trend in gift giving right now is a Box of Sunshine! We took a peak around the internet to find you the best options out there, and I will admit we are a little biased but we found something for every budget and even a do it yourself option. We found this do it yourself box on Happy Money Saver There is a free download for their cute little card to add to a box that you create yourself. Karrie used a variety of her favorite yellow goodies to fill the box. If you are the do it yourself type and want to create a box that is really personal this is a great option. This little gem is from Parcelly. They put together a clever little box full of fun surprises, including a a Hugs Not Ughs tote bag. This box is $40.93 (they are in Canada). Last, but of course, not least Confetti Gift Company has several Box of Sunshine options. They have a kids box, a surprise ball Box of Sunshine for all ages and two options that are a bit more adult. Their boxes range from $28-$36 depending on what's inside. I hope this inspired you to brighten someone's day! I am contacted daily by new Etsy sellers asking for help. How do they build a successful shop on Etsy and turn it into their day job? It doesn't happen overnight, but it definitely can happen! I opened my first Etsy shop over seven years ago and have absolutely loved selling on Etsy. Since my first shop opened in 2010 I did quit working for someone else and now work full time for myself. 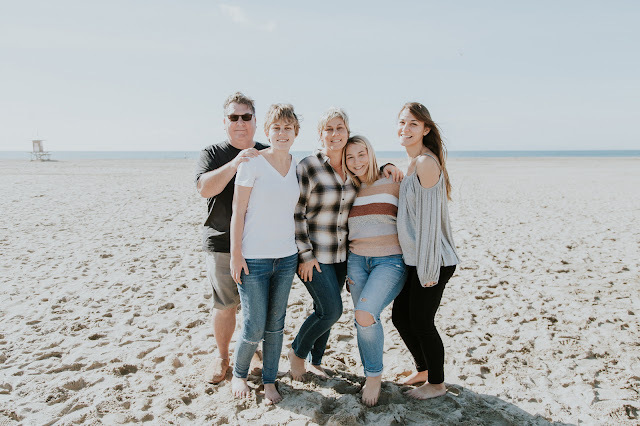 A tiny smidge about me, I am Tawnya Beck Zebrowski, the oldest sister in a family of five girls, that has blossomed into a family of nearly 30. I have been married for 22 years and have 3 daughters Taylor 24, Breanne 20 and Kaitlin 18. Growing up in a large family there was never a shortage of birthday parties, bridal showers, baby showers, weddings and family gatherings to plan and prepare for. Over the years I developed a true passion for the sport and I love scouring the internet, researching the current trends and looking into unique gift and favor ideas to fill the needs of my customers. I promise I won't bore you, but a little bit about the biz...in 2012 I moved my favor business out of my house and we opened a studio in Rancho Santa Margarita, CA. This allowed me to expand my product line and hire some pretty amazing ladies to help keep up with the demand for our products. Over the next few years I opened several Etsy shops. The Favor Box, selling favor packaging, LuLu Sugar, offering high end bath and body products and soy candle favors, Hello You Candles, selling personalized gift candles for absolutely EVERY occasion, and finally Confetti Gift Company, offering a clever line of gift boxes and surprise balls. I partnered with my very talented sister on this one and I must admit it is probably the most fun I have ever had. In 2014 we launched, The Favor Design Studio, Inc. where we took all of our favor products from The Favor Box and Lulu Sugar and combined them into one website. This was more for marketing purposes, we still have all of our Etsy shops and wouldn't change a thing. Gifting With Style is truly my hobby. I love giving gifts and I am always trying to find the next great thing for myself and my customers. You have to have a great product! You don't have to be the only one selling this product, if you put out a great product you will get your piece of the pie. The picture have to be great! Here is a video that I found on YouTube from A Beautiful Mess. They give a lot of photography and styling advise that I completely 100% follow myself. Offer lots of items! The more items you have in your shop the more traffic you are going to get, especially if the listings appeal to different people. For example in my shop Hello You Candles I have one candle for a best friend and one for someone who lost a pet. The search terms for each of these items would be completely unrelated but will both drive traffic to my shop. Which leads me to key words!! Very important key words. Think like your customer, really actually do the exercise of going to the Etsy search bar and type in what you would type in if you were looking for what you sell. You will be surprised when you do the exercise how differently you start thinking. Once the results come up take a look and see if your item would make sense among the displayed items. Do this with several words and phrases to come up with your key words. It takes a bit of time but in the long run well worth the effort. Another key word tip is to scroll to the bottom of the page and it will have suggested links. If these apply to your products use them, you can only have 13 phrases per item so pick wisely. Renewals! Expensive yes, but the payoff is huge. I renew 40 items in each of my shops every morning stating with the listings with the best performance. Every time you renew a listing it gives that listing a boost in the rankings. Sometimes you don't see it right away but I definitely notice a difference. Make yourself available! If someone has a question, they want an answer five minutes ago. I have the Etsy Seller app on my phone and I am (almost) always on duty. If I don't respond they may move on to another seller with a similar product. Always be selling! If someone does message you with a question about a product this is your chance to sell it. Offer a discount for a large order or if ordering multiple items ask if they want a custom listing to make it easier for them to checkout. And last but not least get back to the basics! Ship on time; the customer is always right; if the items get lost in the mail or destroyed send replacements even if it's not your fault. It can be costly but those great reviews will keep the sales rolling in. Hope this helps! Please feel free to contact me with any questions, I love seeing Etsy sellers succeed. Whoopie Pie Mixes just in time for the Holidays, Whoopie! Grab Your Bags - Bagnesia Giveaway! Halloween Party Favors!! Trick or treat?